1950's Vintage Pair Sterling Silver. Pink/ Blue Bug Fur Clips. We believe these were intended to be a pair of fur clips. It's bugging us that we don't know more about them. We believe them to be from circa 1950. A popular bug design with vibrant colors. 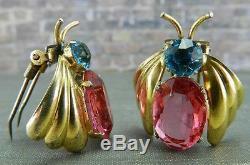 Large pink and blue stones make up the body to these colorful, winged bugs. Yellow gold color over Sterling Silver. The clips are pointy and sharp, consistent with fur clips. Each measures a little over 1" long by about 1" wide. Please see pictures for details and condition These are vintage and not new. 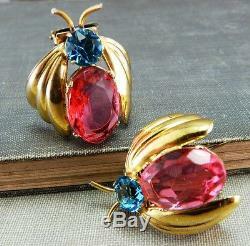 They are in very nice condition but you may find some light wear or patina from age and use. Quarter for size reference only and not part of this sale. 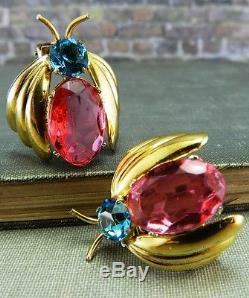 To see more vintage jewelry. For specials, tips and vintage facts & fun! Read our "terms" below for further details. "Like" us for Specials, Vintage Tips, Facts & Fun! Most items are pre-owned and any significant flaws or signs of wear that we see will be pictured or described to the best of our ability. Our items are not always perfect and occasionally we aren't perfect either (although we do our best). We are not experts regarding this item. We simply have lovely, pre-owned items available for sale. Our precious metals and diamonds are independently tested for authenticity and we stand behind our listings. We do our best to describe things given our training, knowledge, ability and research. Colors may vary slightly due to settings on monitors and electronic devices. Pictures, unless otherwise stated, are of the actual item that you will receive. Our pictures are usually taken at a very high level of magnification and therefore, typically show many more imperfections than the naked eye will see. In other words, many people think their item looks even better in person! All pictures are property of Antique ReVisions and may not be reproduced without consent. Any props pictured coins, books, etc. Are for size reference or decoration only and are not part of the sale. All items are housed in a smoke-free environment. Any odors detected will be mentioned in the item description. Unless otherwise stated, we do not have original packaging. As long as circumstances permit, all jewelry items will include our box or pouch suitable for storage or gift-giving. When you're done shopping, REQUEST AN INVOICE and DO NOT PAY yet. We do our best to work with you. In the event of a return, item must be received back within 30 days of sale in same condition as sent. Items are discreetly identified for security purposes. International sales failing to meet legal regulations or requirements may have orders cancelled at our discretion. Please don't ask us to report a different dollar value to the post office or government. Thanks for shopping with Antique ReVisions. Sometimes old can be new again and even better the second time around! 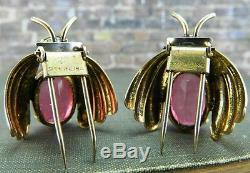 The item "1950's Vintage Pair Sterling Silver Pink/ Blue Bug Fur Clips" is in sale since Monday, November 12, 2012. This item is in the category "Jewelry & Watches\Vintage & Antique Jewelry\Costume\Retro, Vintage 1930s-1980s\Dress & Scarf Clips". The seller is "antique-revisions" and is located in New Oxford, Pennsylvania.